Quirky Jessi: One timer for it all....dream or nightmare? One timer for it all....dream or nightmare? Yep, it's a timer. 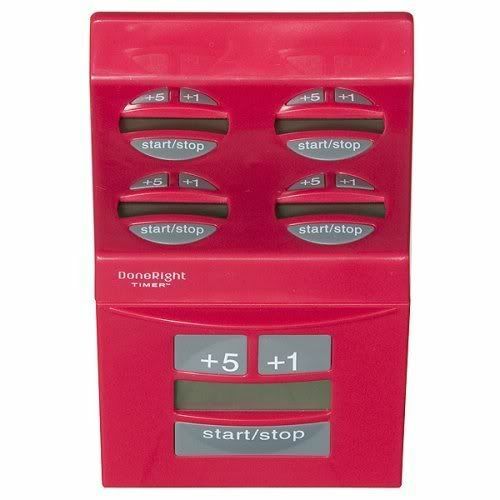 It has four different timers so you can keep track of multiple things at once. More than once I've had to kick off a timer on the microwave in order to time something different...or to actually use the microwave instead. At first, this sounded like a great idea. And then, of course, my mind started to wander to which things I'd be timing at once. How would I keep track of which timer was for what? And what about those overly busy (or lazy) people who would get them mixed up, only to burn the cookies or fried potatoes because they didn't check the food they were timing. Hmm. It's either the multi-taskers dream....or nightmare, with timers buzzing all over the place. The description on Amazon didn't really say anything about it either. I hunted it down elsewhere and found out it's LCD and has flashing lights to go with the audible timer....uh oh. So now we've got lights and sirens going off...woohoo! There was a review that absolutely loved it, but sorry guys, for 30 bucks + shipping, I think I'll stick with the microwave...and maybe a cheap timer on the side that I can't for the life of me ever figure out how to get it to shut up, hehe. For those interested, though, it comes in that lovely red up top (um, looks pink to me), black, white, and silver. Ooooo...fancy, hehe. It looks terribly complicated. If it had different sounds for each timer that might work if they were different enough. I use the oven timer and the microwave timer: sometimes to time a single thing, so that if I don't hear one timer go I'll hear the other one. I can't imagine needing more than those two.